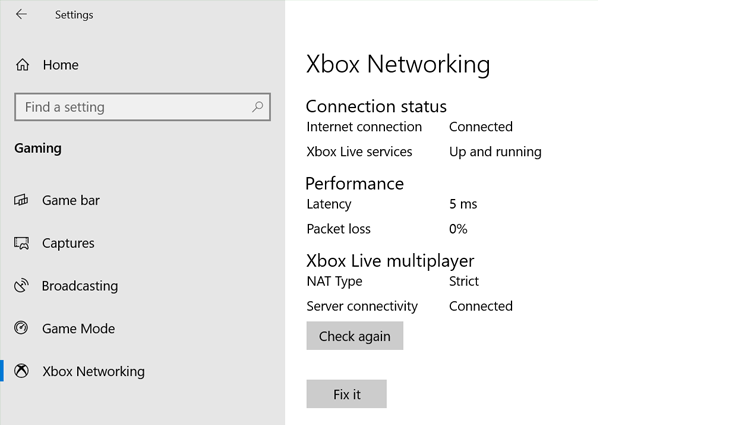 If you can’t join or host an Xbox Live multiplayer game, or you can’t connect to a party chat session, press the Start button, select Settings > Gaming > Xbox Networking and check NAT type. If it says Teredo is unable to qualify, your PC is unable to obtain a Teredo IP address. Teredo is a networking protocol that’s used to establish secure communications between clients and servers, and to facilitate connectivity between devices behind routers that use network address translation (NAT). Failure to obtain a Teredo IP address can occur when there’s an issue with your Teredo adapter, when a device on your network is blocking the Teredo protocol, or if there’s software installed on your PC that’s disabling Teredo functionality. Without a Teredo IP address, you’ll be unable to use party chat or do multiplayer gaming on Xbox Live. Note The Teredo IP address is only necessary for Xbox Live party chat and multiplayer features. If your game doesn’t use the Xbox Live service, consult that game’s support site for help on chat and multiplayer issues. Try the following solutions in order. Move on to the next one only if the previous one didn’t resolve the issue. On your PC, open the Xbox app. Under Network status, make sure Internet connection says Connected. If you don’t have an Internet connection, you’ll have to fix that before continuing with any additional troubleshooting. On your PC, press the Start button, then select Settings. Select Gaming > Xbox Networking. Select Fix it. Windows will try to detect and fix known issues with Teredo. Note You might need to restart your PC for changes to take effect after pressing the Fix it button. Some programs can alter your PC’s network settings with the purpose of disabling IPv6 (Internet Protocol version 6) networking components, which can include the Teredo tunneling adapter. You can determine whether Teredo has been disabled by running the following commands. Right-click the Start button, and then select Command Prompt (Admin). While some applications set these registry values to disable Teredo when the application is installed, others set them every time the application starts. If your PC has one of these applications installed, make sure you have the most up-to-date version, or see their support documentation to learn how to enable Teredo tunneling with their software. * Asus Game First Service: Update to the latest version, or contact their support at http://asus.com/support. Press the Start button, then type Services in the search box. In the Services application, double-click on IP Helper. In the Properties window, select Automatic from the Startup type drop-down list. Under Service status, click the Start button. Click on OK to save the changes. Some applications reconfigure PC settings to try to optimize performance and will disable Windows services in the process, sometimes affecting the IP Helper service. If you use one of these PC optimization applications, make note of any service configuration changes it makes, as you may need to revert those settings to use Xbox Live party chat and multiplayer. If you’re still seeing the failed to resolve server name text after re-running the netsh interface Teredo show state command, you might have an application that is configured to block your PC from connecting to Teredo servers by adding entries to the hosts file located under C:\WINDOWS\system32\drivers\etc\hosts. Make note of the server name value that is shown in the output, e.g. win1807.ipv6.microsoft.com. If an entry is found with that server name, delete the entry and then save the hosts file. Apple AirPort: Visit AirPort + Wi-Fi Support or the Xbox Support Forums for Apple routers at Xbox Forums: Apple. AVM FRITZ!Box: Visit FRITZ!Box Service or the Xbox Support Forums for AVM gateways at Xbox Forums: Fritz!Box. Right-click the Start button, and then select Device Manager. Select View > Show Hidden Devices. Identify any adapters that have a name like TAP-Windows Adapter V9. Right-click the adapter name, and then select Uninstall. Note While uninstalling the VPN network adapter should unblock Teredo connectivity, this will also likely cause issues with the VPN client software. If you still require VPN functionality along with Teredo support, refer to the support documentation for the VPN client. Would you like to contact Support regarding the "Xbox app NAT type on Windows 10 displays “Teredo is unable to qualify”" issue you were reading about or a different issue?